T-birds, an outhouse, green chile and chocolate. Verne Solberg poses in his house. We approached information overload today after seeing a T-Bird collection, a post office, an outhouse, heard about chocolate made from honey, ate New Mexican green chile and wondered if homesteading really meant homesteading. 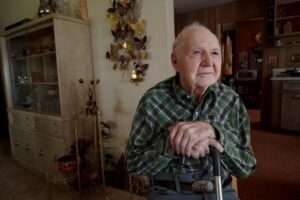 The day started out at Verne Solberg’s house on Road 20, a few miles from the Heart Mountain Interpretive Center. The 96-year-old was one of the original homesteaders in area. He’s quite sharp and has a good memory for how his house was built out of barrack sections. It’s composed of a half barrack, which he then added on rooms, a fireplace and various features over the years. Most of the work he did himself. Another half barrack was turned into a guest house. 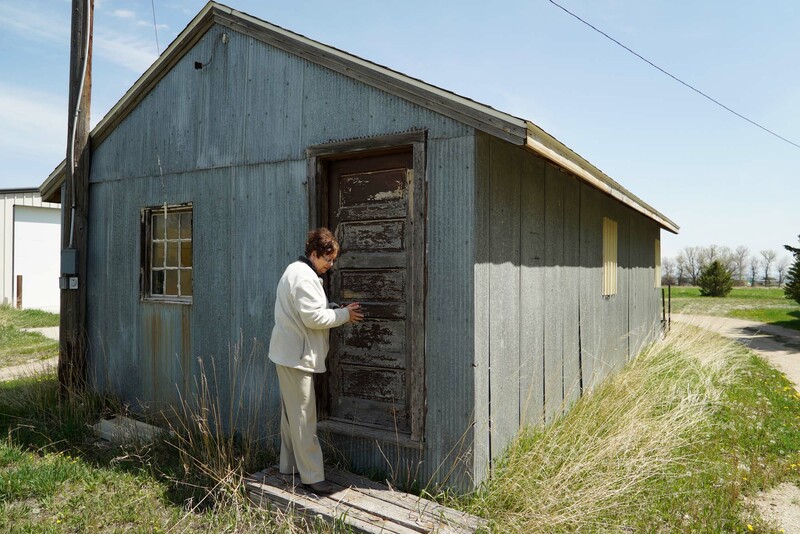 And another section about 40 feet long on Verne’s property turns out to be the Heart Mountain camp post office, still with the half-door and sliding wood half door at the customer counter. Interior walls and a wood ceiling painted white are still intact. The original door and windows grace the structure. He’s not sure how he acquired the post office. 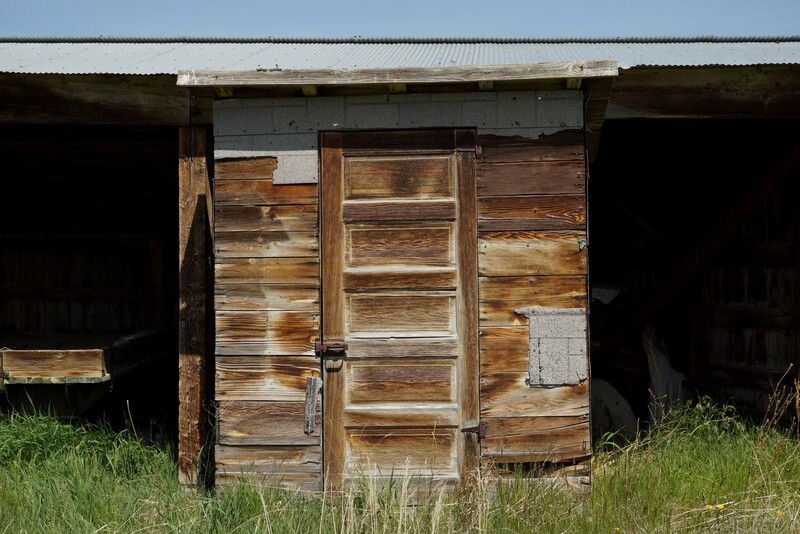 An outhouse made of salvaged pieces of wood planks from a barrack sat near a storage shed. Toilet seats over holes cut in a bench provided some comfort. Without plumbing, the homesteaders all had to construct outhouses. Verne’s outhouse, made from salvaged barracks wood and a door. Carla shows us the post office building. Carla Solberg, (used to be married to Verne’s son and now divorced, but still is Verne’s caregiver), opened up a huge metal shed to show us his Thunderbird car collection. Most are early 60’s models and he also has a vintage Ford, a boat and late model Lincoln. Up the road we stop to photograph Suzanne Rankin’s house, two barrack sections fused in a t-shape and greatly modified. 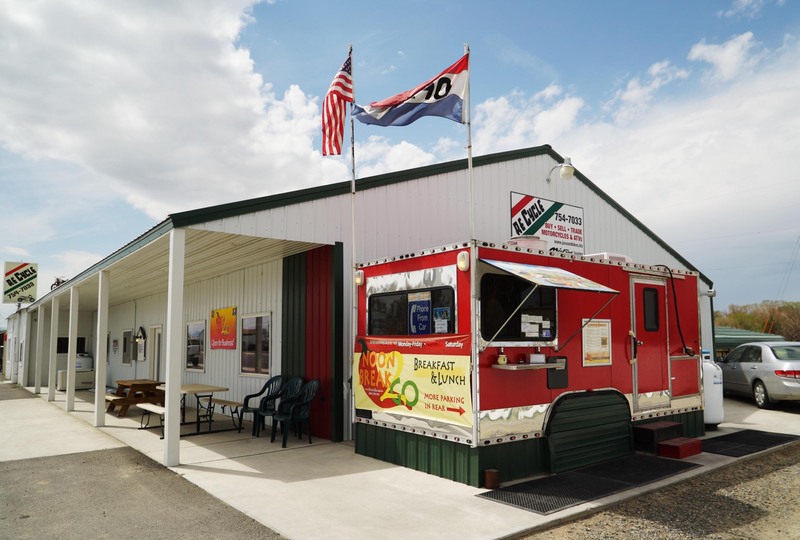 Then Carla treats us to lunch at Noon Break, a semi-permanent food truck on the road to Powell, run by Suzanne and husband Steve. Turns out Steve makes some of the best green chile (probably the only green chile) in the Big Horn Basin. 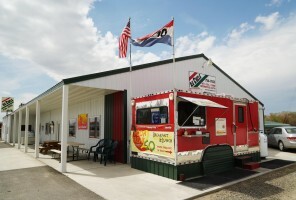 The Noon Break restaurant, situated next to Re Cycle, a motorcycle shop. At Northwest College in Powell we meet with four really fascinating history department professors who have various knowledge of Wyoming and Heart Mountain history and a very intense interest in the Japanese American experience. We find out that if homesteaders paid the Bureau of Reclamation, who administered the Heart Mountain region homesteading program, for the land, then technically the people weren’t homesteaders. At least according to the Homesteading Act of 1862. Sharon said no one in the interviews has mentioned paying for the land, and most of the people were pretty poor so they probably couldn’t afford to. Anyway, everyone thinks of themselves as homesteaders. More importantly, we got recommendations for two places to get Wyoming chocolate- Lovell and Meeteetse. One has chocolate made from honey and the other various flavored truffles. I forgot which town had which, but we are going to both to see some barracks and will make side trips to the shops. Ken, Yes! They are all in various parts and condition, the houses sometimes use 2-3 portions in different configurations. So you aren’t always sure you’re looking at a barrack. Then the new homes here have the basic barrack shape, confusing things. But it’s been good work so far. Looks as if you have hit the mother lode! Who could imagine that there are pieces of barracks all over the landscape! Keep up the great work, information overload or not!